Live In Faith Everyday Ministries is a non-denominational church providing a variety of Christian ministries. We provide an open and welcoming non-denominational worship environment. Dr. Walter Capers came to the Lord at a young age and pursued college studies and Army service before answering his vocation to the ministry. We invite you to read more about our non-denominational church's pastor history of service to God's people. Dr. Walter Capers works with several partners who oversee various ministries in our church. 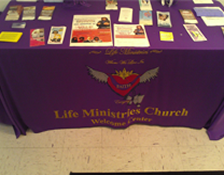 Contact Live In Faith Everyday Ministries ( LIFE) in Beaufort, South Carolina, to request more information about our non-denominational church. Grow in grace at Live In Faith Everyday Ministries, a non-denominational church providing a variety of ministries in Beaufort, South Carolina. Our pastors, Dr. Walter and Dianne Capers, has been in active ministry for more than 30 years. Live In Faith Everyday (LIFE) Ministries was founded under the direction of the Holy Spirit. The Lord gave the church name to our pastors, in March of 2007. Our pastors stepped out on faith to do the work God had commissioned them to do. This has confirmed many prophecies they received down through the years. The Lord blessed LIFE Ministries' Ministerial Team with elders, evangelists, and deacons. Our goal is to win the lost, at any cost, and to equip the saints to live a victorious life in Christ. We thank God for the many souls that have been saved, delivered, and set free. Live In Faith Everyday Ministries continues the great commission, to go into the entire world and preach the Gospel. We believe that the only means of being cleansed from sin is through repentance, faith in the precious Blessed of Jesus Christ and being baptize in water. We believe in the baptism of the Holy Ghost according to Acts 2:4 is given to believers who asks. We believe in the sanctifying power of the Holy Spirit, by whose and dwelling the Christian is enabled to live a Holy and separate life in this present world.